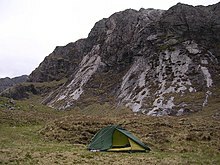 Both commercial and governmental campgrounds typically charge a nominal fee for the privilege of camping there, to cover expenses, and in the case of an independent campground, to make a profit. However, there are some in North America that do not charge a use fee and rely on sources such as donations and tax dollars. Staying the night in a big-box store parking lot is also common (called "boondocking"), and some retailers welcome RVs to their parking lots. 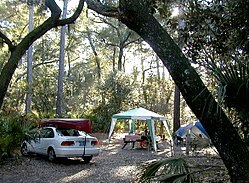 Some RV parks provide year-round spaces. Holiday homes can be rented on an ad-hoc basis or purchased – caravans can be purchased from around £30,000 while park homes and lodges can cost between £100,000 and £500,000. As with camping, campgrounds predated the automobile. When President Theodore Roosevelt addressed Congress in 1901, he called for the creation of free campgrounds on Federal lands. Already four national parks—Yellowstone, Sequoia, Yosemite, and Mount Rainier—were established and by the time Congress formally established the National Park Service in 1916, America had a dozen national parks. While a handful of campgrounds, both public and private, could be found at tourist destinations, as late as 1936 it was still difficult to find places to stop along the route to these parks. 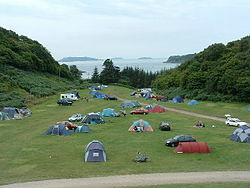 Instead, it was common for motorists to pull off the road and set up camp on private property. This practice not only reinforced the negative, nomadic image of RV travelers, it was a detriment to expanding the trailer market. The Trailer Coach Manufacturers Association began to lobby states to establish sanitation standards and worked with civic and business leaders to establish additional campgrounds, emphasizing the economic benefits of a campground in their community. The Denver Civic Association wrote that a campground was just as essential to a town as a railway station. The trailer industry's efforts were effective. The number of campgrounds in the Trailer Travel Magazine's directory of campgrounds doubled to 1,650 by the end of 1936 and promised to double again by the end of 1937. The campgrounds themselves also changed. Martin Hogue wrote, “The first public campgrounds in the United States were nothing more than large, dedicated clearings, free of trees, within which to concentrate groups of tourists.” A plant pathologist named Emilio Meinecke, was commissioned to study the effect of motor tourism in the Redwoods in 1929. Meinicke's recommendations explained that instead of allowing campers to park haphazardly within a park, the camper's impact on the environment could be minimized through campground roads forming a one-way loop leading to individual parking spurs next to each campsite. 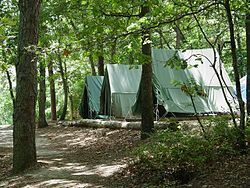 Although he would later continue to write of the effect of campers on nature, submitting a memorandum to the National Forest Service in 1935 entitled “The Trailer Menace,” he had established the basic design for campgrounds still used today. ^ Roosevelt, Theodore (1901). "Extracts from President Roosevelt's Message to the Congress". Science. 14 (363): 907–912. doi:10.1126/science.14.363.907. JSTOR 1627679.